I loved this book! Stella moved about a year ago to a new high school but is so quiet that nobody really knows who she is and she only has one friend, Lily. She has a beautiful voice and finally took a chance by trying out for the school play. Amazingly, she lands the starring role! She's becoming more popular and is on the verge of her dreams coming true. However, a tragic accident changes everything. When she wakes up, she learns that she's deaf and she's not sure what that means for her future. Hayden is a new boy who is considered to be weird because he speaks slowly and stutters. He's also a talented pianist and Stella feels a connection to him but doesn't make an effort to get to know him. Until the accident. He saves her physically and now he's challenging her to give him 17 days to help her imagine herself differently. This book alternates between Stella and Hayden so we get to know both of them well. Hayden is keeping a secret and it's the reason he stutters. Stella is devastated when she learns she's deaf. She starts to retreat into herself. When there are 17 days before she is scheduled to meet with the audiologist to see if she will be able to hear again, Hayden asks her for that time so he can help her imagine herself differently. She figures she has nothing to lose so she agrees. I loved Stella and Hayden's time together and the things they were able to experience. They slowly opened up to each other and Stella learned about other talents she had through using her other senses. There are some great side characters, too. I loved Stella's mother and sister, Emerson. They were supportive and loving. Stella and Emerson grew closer after the accident. I also loved Hayden's grandfather. He gave Hayden a loving and stable home and expressed himself through his sculptures. 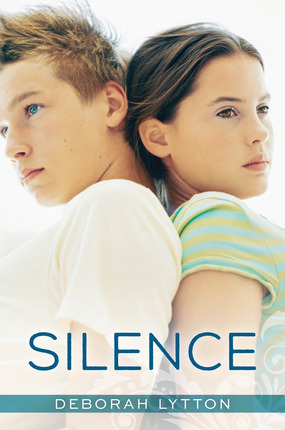 While reading this book, I thought about how it would feel to not be able to hear. Life would be so challenging. I enjoyed reading about Stella and what she was able to learn through her experience. I also love that this book is clean and one that I will be able to pass on to my daughter when she's a little older. It's a fantastic book which helps explore other options when life doesn't go the way you planned!! I look forward to reading more by this author in the future! I loved this book. I wasn't sure how I would feel about it at first--it is written in first person, present tense, which is tricky to do and keep everything straight. Lytton did a great job with the voice and point of view as well as the present tense. Silence struck a chord with me because I love music and enjoy singing, so I kept imagining myself in Stella's place and how I would handle things. Envisioning her struggle through a teen's eyes, she handled things extremely well. It was neat to read about all the possibilities there are for hearing loss and also be reminded of just how difficult it is to live without sound or impaired hearing. I enjoyed experiencing the push and pull of Stella's relationship with Hayden as they both rediscover themselves and found a way to heal. Lytton's writing is lyrical, full of music itself and the story carries itself forward in a realistic way that makes you feel as if you really know Stella and Hayden and their families. I was given a review copy of this book in exchange for my honest opinion. The synopsis of this book appealed to me because Stella is a musician, who looses her ability to hear music. As a teen my life revolved around my orchestra and choir concerts and I am drawn to books where the characters are involved in music. Stella has an amazing talent as a singer. She is able to move others with her voice. While at practice for her high school musical, a new boy is introduced as the pianist. Hayden is also a talented musician, but he stutters and some people have a hard time with that. The two are drawn to each other before Stella has an accident and looses her hearing. The way that Hayden is able show Stella more to the world than sound is beautiful. He understands her, and is able to point out dolphins in the ocean, the beauty of paint and a paintbrush, and many more things. He shows her a world that is more than the one that she had been living in. The most important thing that he shares with her is emotional support. This book does a wonderful job at making you think. The importance of true friendship, the beauty of the world, and surviving physical trauma are all subjects of the book. I think that this is a book that be on my mind for a while after the last page has been closed. My Rating: 3.5 stars! I liked this book. I was annoyed at the beginning by the writing style. It has. a lot. of. short. sentences. Many of them aren't even sentences, but fragments of sentences, and it bothered me. But, as I got into the story it didn't bother me as much. I thought the characters were well developed and mostly believable. I thought they were a little too young to have the insights, depth, and relationship that they did, and that made it seem a little unrealistic, but they were cute characters and it didn't stop me from reading it. I wish they had been college-age because I think that would have seemed more realistic. Also, I definitely don't want my kids to be that involved when they are still in high school. However, I loved the lessons that were taught in this book. I loved that they started out as friends and let the relationship grow from there. I loved the lesson of not allowing your experiences to defeat you, but learning and growing from them instead. I loved that they were able to view things from different perspectives, and find more in life than cheerleading and high school musicals. This was a sweet love story, and it was clean! Yay! There is no profanity or "intimacy." There are a few kisses, but that's it. There is some domestic violence and abuse. This book is appropriate for Young Adults (13+). You may read my full review on my book blog: the-readathon.blogspot.com. A Great Read! A Sweet Romance! Sophomore, Stella Layne has been a quiet, shy presence her whole life. She has always known she could sing but it was a talent that she hadn't shared much, until this year when she auditions for the school play and shocks everyone with her amazing voice. Cast as Maria in West Side Story she goes from a virtual unknown to a most popular girl overnight. It is during rehearsals that she meets a Hayden. Hayden is an amazing piano player, he's handsome, and he stutters. While others make fun of Hayden, Stella finds something in his eyes that make her want to get to know him better. The night before the opening of West Side Story, Stella falls into a pool and hits her head during a cast party. The next morning she discovers that her world has become silent. Afraid and anxious Stella tries to slip into a depression but Hayden refuses to let her. He takes her on a journey, showing Stella that a "new normal" is ok. And that deaf or hearing, she too will be ok.